How do you say good-bye to someone like Don Launer? We received word from the family of Don Launer that he died on June 15th following a massive stroke on June 7th. Don has been part of the Good Old Boat crew since the first year, writing many technical articles, most recently the ongoing series we called Saiboats 101. 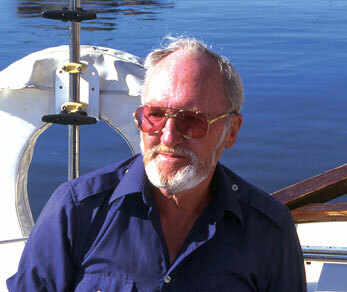 Don lectured about nautical history, wrote more than 400 articles for boating magazines and newspapers, published seven books on marine subjects, starting with the Cruising Guide to New Jersey Water in 1995, and earned a commercial captain's license from the U.S. Coast Guard. He was inducted into the Sailing Hall of Fame in 2010. 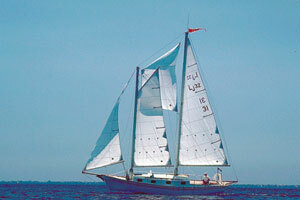 In addition, he built his Lazy Jack schooner, Delphinus, from a bare hull. But that describes (and only briefly) the boating facet of the multi-faceted and talented man who was Don Launer. He was so much more than a sailor, and everything he did was accomplished to the very best of his abilities. He built his family home, a three-story brick structure with a legendary wine cellar. He was a combat veteran in WWII. Following the war, he was engineering supervisor with ABC-TV from the time they went on the air in 1948 until his retirement in 1989. Among other things, he handled Olympics coverage for ABC, winning two Emmy Awards. He played his baby grand piano daily, favoring Gershwin tunes, and held a pilot's license for land and sea planes. Don's website, maintained by his granddaughter, Jennifer, offers his books for sale and tells more about this remarkable man: donaldlauner.com. He is survived by his daughter, Kathryn, his son and daughter-in-law, Thomas and Margaret, and his grandchildren, Jennifer and Nancy. We're planning to run readers' comments in our next issue about how Don Launer influenced their lives either personally or through his writing or how he influenced sailing in a broader way. If you would like to make a personal tribute to Don, please send your comments to Karen Larson: karen@goodoldboat.com. Please send your thoughts by June 26. We cannot express the depth of this loss to Good Old Boat and to sailors everywhere.